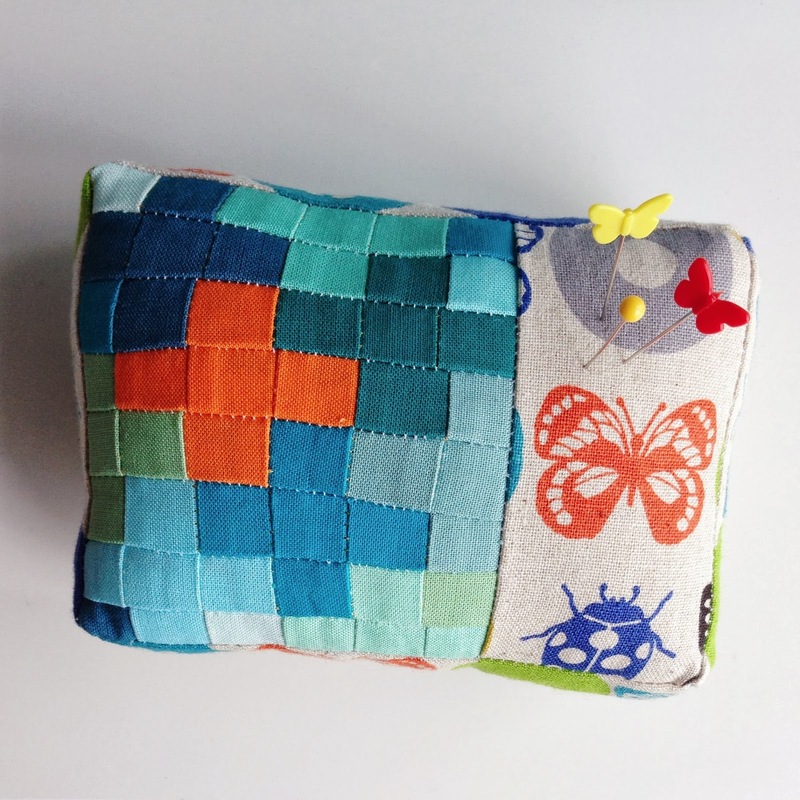 At this month's South Bay Area Modern Quilt Guild meeting some of us swapped pincushions. We were assigned secret partners last month and we received a little note with a list of our partners likes. My partner likes aqua, orange and green. Sometimes its hard to keep it simple. I had complicated plans, but in the end I decided I liked simple best. Let the colors and fabric shine! I used the Fresh-Picked pincushion pattern by Heather Bailey. The fabric is a mix of two older prints from my beloved stash, Bijoux by Heather Bailey and Type by Julia Rothman. The leaf is made out of wool felt in a lime green on top and aqua on the bottom. I hand-stitched the details on the leaf with Cosmo embroidery floss. I keep a stash of those little leaf pins for gifts. They are kind of chunky to actually use, but they are so cute to decorate pincushions with. Little did I know, I was in for a dual swap. My secret partner turned out to be my friend Julie, and she had me for her secret partner. So funny!! She made me the most incredible pincushion ever! Seriously. Look at this beautiful creation!! I don't even remember what I said I liked, but I love this. She absolutely nailed it. I added the pins for the photo so you can see how teeny-tiny the piecing is. It's a mini version of this table runner she made a couple of years ago. Isn't it gorgeous? And that is not all! 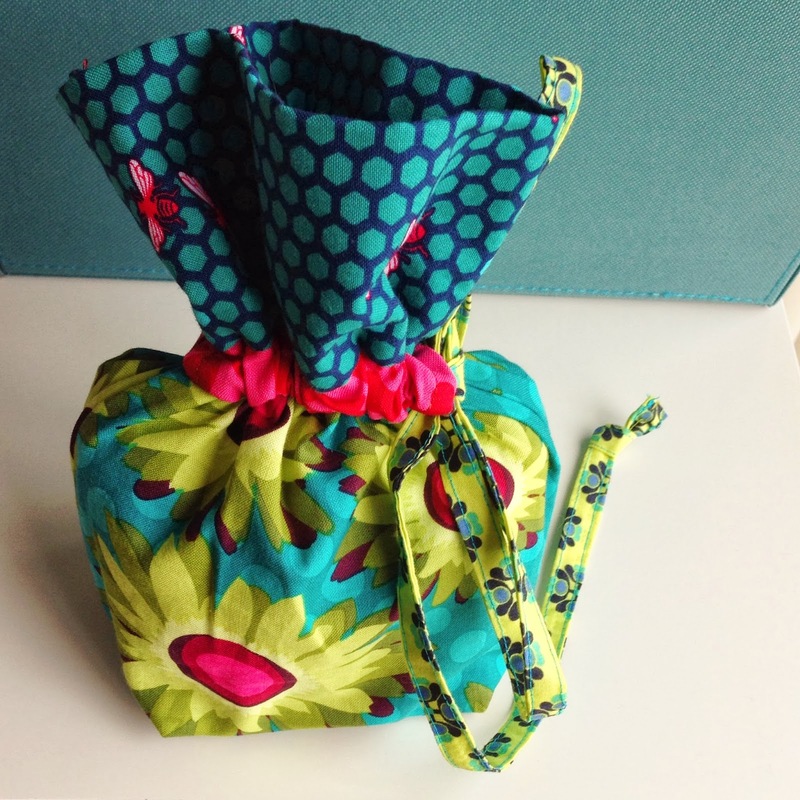 She made this beautiful little bag to wrap it in. The perfect combination of fabric and color and expertly sewn - all the seams are enclosed, inside and out. 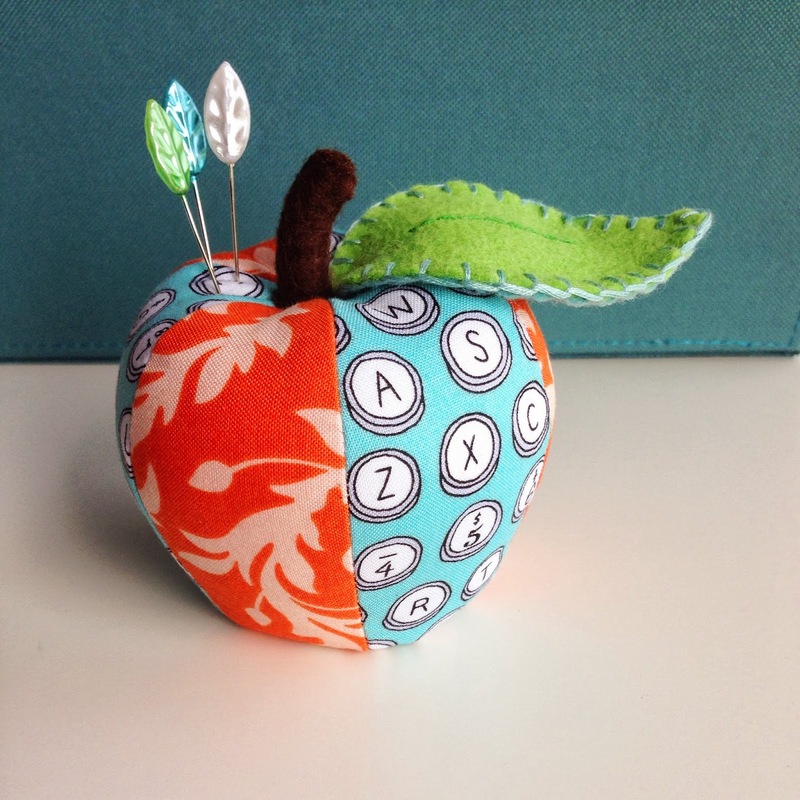 I want one of those apple pincushions! Nice job all around. Let me know if you need a ride from BART on Sat. Excellent swap! The apple is so cute!